Managing your online reputation can be a daunting task at times – whether it’s because you’ve posted something less than smart on Facebook, someone assumes your name or someone is talking about you and your business and you can’t control what they’re saying. The Internet is impossible to control, and anyone can say anything about you – that, in the end, is the beauty of the Internet. However, it’s not just about what others are saying about you, but also how you conduct yourself online, and especially on social media that can damage your reputation. Google Alerts is a simple free tool that you can set up to get alerts whenever someone mentions your businesses’ name (or whatever else you want, for that matter). Simply write down your search query (in this case the name), and select when you want to be alerted. You can choose between once a day, once a week or as it happens if you want to always be on alert. Social Mention is a free tool where you enter the keywords in the search bar and see all the mentions that keyword gets across social media. It’s very similar to Google Alerts, only it focuses on social media and the results aren’t always as relevant – but it still is a great tool. Trackur is a paid tool that does full social media monitoring – meaning news, blogs and all the major social networks – a total of hundreds of millions of sources as they advertise it. Trackur also analyses the sentiments around the conversations about your brand and identifies the people behind the conversations and their influence. Have a strategy. Make sure you are clear on what reputation you want to have online and have a strategy in place, preferably before you start setting up your website and social networking profiles. Be consistent. When managing your online reputation, it is important to make sure you are consistent across all platforms. Try to maintain the same image on your website, blog, social networking profiles, which also helps with avoiding confusion about who you are. 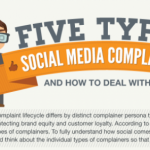 Deal with social media complaints immediately. There’s always a chance that someone will complain about you or your business or even make some inappropriate comments. It’s very important to deal with these kinds of situations as soon as possible, and to try to be diplomatic at all times – as the popular saying goes, the customer is always right, and that also applies to the Internet. Since everyone can see these comments, tweets or posts it is important to be polite and respectful when responding. Manage your customer service online. If your business has a social media presence, you can expect to receive questions and complaints from your customers. Make sure you respond to them promptly and politely. More and more people are seeking customer service through social media and their tweets, posts and comments. Buy domain names. When you set up your business online, it might be a good idea to buy a few domain names that hold your businesses’ name. This way no one else will be able to get a domain name containing your brand name, helping avoid confusion among your audience. Google. Google your name/company name/product name regularly to see what comes up on the first few pages. If you have the resources, consider investing in search engine optimization so that more of the results you want appear on the first page of Google searches – such as your website, your blog posts etc. Try removing, whenever possible, any unwanted information (be it photos, blog posts or videos) from the Internet to avoid having more people see it. You can get more information on how to remove unwanted content from the web here. Think before you write/post. This goes for both blog posts and social media updates. While I am a huge believer that being outspoken and controversial are great things, you still should check and make sure you don’t offend anyone, contradict yourself or even simply say something stupid in the heat of the moment. You might be able to delete a post even after you’ve published it, but chances are someone has still seen it – the Internet is never truly private and everyone can make mistakes (remember Anthony Weiner’s Twitter disaster?). Employees. If you’re employees are social media users, ask them to mention in their descriptions that the opinions they express on their profiles are their own, and nobody else’s so as to avoid being accused of any racy updates by association. How are you managing your online reputation? Please leave your comments below!